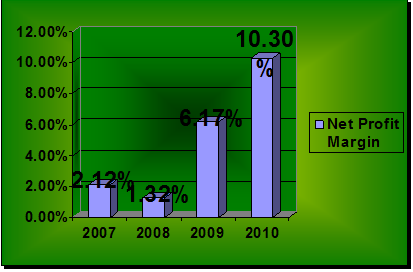 The non-interest margin, I contrast, measures the amount of non-interest revenues stemming from deposit service changes and other service fees the bank has been able to collect (called fee income) relative to the amount of non-interest costs incurred (including salaries and wages, repair and maintenance costs on bank facilities, and loan-loss expenses). For most banks, the non-interest margin is negative: non-interest costs generally outstrip fee income; through bank fee income has been rising rapidly in recent years as a percentage of all revenues. 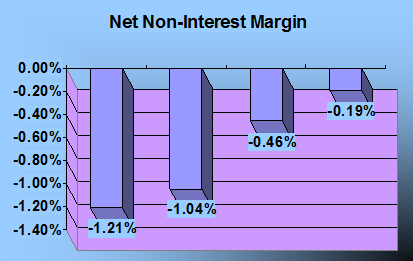 For most bank the non-interest margin is negative and that the normal. But in case of ABBL the positive thing is that the spread between the non-interest income and the expenses is become less day by day. In the above figure we see that in year 2002 the non-interest margin was -1.21% but in year 2005 it was only -0.19% which proves that the bank generating more income which is not related to the loan or interest than it did before. And in future it could be in positive figure. Earning per share is the ratio of bank’s net – income after tax divided by the total common equity share outstanding which means how much profit will get the shareholder on their owned share. Earning per share is the main indicator of an organization’s wealth. 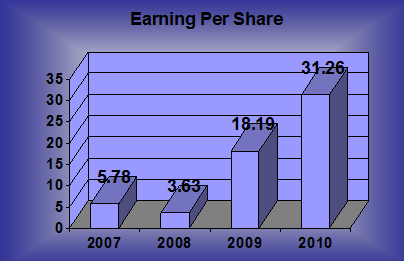 If the EPS is increasing year by year then we can say that the organization is doing well. Here in the above graph we see that the EPS of ABBL in year 2005 is increased by 10 times than the year 2003 when ABBL went through a bad time. But now they are in a position which is more than the satisfactory level. The Net Profit Margin (NPM), or the ration of the net income to total revenues, is subject to some degree of management control and direction. It reflects the effectiveness of expense management (cost control) and service pricing policies. It reminds us that banks can increase their earnings and their return to their stockholders by successfully controlling expenses and maximizing revenues. Where the net profit margin shown the efficiency of the management control and direction we can say that the management of ABBL is doing well in the recent time than the before. If we see the net profit margin in year 2002 and year 2003 it was 2.12% and 1.32% respectively but in last year the net profit margin was 10.30%. Which shows the management’s control over the expense and the strong but reasonable pricing policies of their service, which they offer to their customer? Assets Utilization (AU) ratio is the product of Total Operating Income divided by the Total Assets that means how much income bank generate by using a single unite of assets. This ratio reflects portfolio management policies, especially the mix and yield on the bank’s assets. By carefully allocating the bank’s assets to the highest-yielding loans and investments while avoiding excessive risk, management can raise the bank’s average yield on its assets. 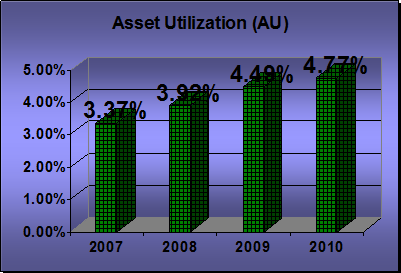 Assets Utilization ratio shows that how efficiently the bank use their assets to generate revenue. In above graph we see that ABBL develop their assets utilization ration by a contentious basis. Which reveal their strong management team, who made the careful and the effective decision about portfolio investment and by avoiding risk as much as possible. 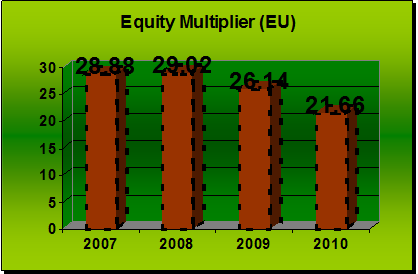 The Equity Multiplier (EM), or assets-to-equity-capital ratio, is normally the largest, averaging about 15* or larger for most bank. The biggest banks in the industry often operate with multipliers of 20* or more. The multiplier is a direct measure of the bank’s degrees of financial leverage–how many portion of assets must be supported by each amount of equity capital and how much of the bank’s resources therefore must rest on debt. Because equity must absorb losses on the bank’s assets, the larger the multiplier, the more exposed to failure risk the bank is. However, the larger the multiplier, the greater the bank’s potential for high returns for it’s stockholders. The multiplier ratio tells us that the higher the multiplier is higher the income and also it lead high risk of bank’s failure. In the above graph we see that the multiplier is decreasing by the time which means that the risk of ABBL is decreasing by the time but the income to the shareholder may decrease with the time. Tax Management Efficiency ratio reflects the bank’s use security gains or losses and other tax-management tools (like buying tax-exempted bonds) to minimize its tax exposure. 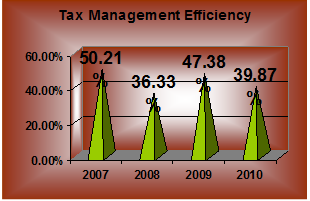 In the above graph we see that the Tax management efficiency was not in a stable level. Some time it was up and some time it was down so we can’t say that the ABBL manage their tax over their earning very efficiently as their expectation. Expenses Management Efficiency ratio is the ratio to before-tax income to total revenue as an indicator of how many Taka of revenue survives after operating expenses are removed expense management efficiency measurement is a measure of operating efficiency and expenses control. it become 25.83%. 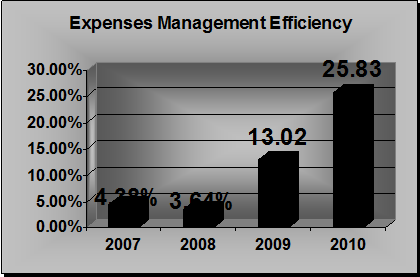 That shows a strong management control over the expenses. Assets Management Efficiency ratio is the product of Total Operating Income divided by the Total Assets that means how much income bank generate by using a single unite of assets. This ratio reflects portfolio management policies, especially the mix and yield on the bank’s assets. By carefully allocating the bank’s assets t the highest-yielding loans and investments while avoiding excessive risk, management can raise the bank’s average yield on its assets. 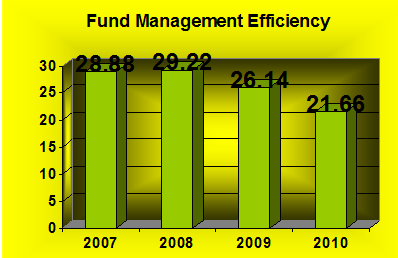 Asset management efficiency is same as the asset utilization. 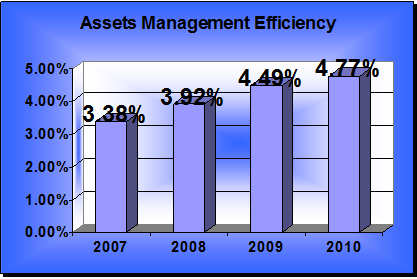 Asset management efficiency shows that how efficiently the bank uses their assets to generate revenue. In above graph we see that ABBL develop their Asset management efficiency by a contentious basis. Which reveal their strong management team, who made the careful and the effective decision about portfolio investment and by avoiding risk as much as possible. The Fund Management Efficiency, or assets-to-equity-capital ratio, or Equity Multiplier is normally the largest, averaging about 15* or larger for most bank. The biggest banks in the industry often operate with multipliers of 20* or more. The multiplier is a direct measure of the bank’s degrees of financial leverage–how many portion of assets must be supported by each amount of equity capital and how much of the bank’s resources therefore must rest on debt. Because equity must absorb losses on the bank’s assets, the larger the multiplier, the more exposed to failure risk the bank is. However, the larger the multiplier, the greater the bank’s potential for high returns for it’s stockholders. The fund management ratio is same to the Equity Multiplier ratio; the multiplier ratio tells us that the higher the multiplier is higher the income and also it lead high risk of bank’s failure. In the above graph we see that the multiplier is decreasing by the time which means that the risk of ABBL is decreasing by the time but the income to the shareholder also decreasing by the time. By analyzing the performance of ABBL we see that this bank really doing well last two years. In year 2004 their net profit margin was 6.17% and year 2005 it become 10.30% which shows their strong management efficiency and the strong control over the operating expenses. Now a day’s people want batter product and service at reasonable price. And AB Bank provides that batter product and service at reasonable price which attract more customer loyalty. The ultimate goal of a business organization is to maximize their wealth not the profit, and the indicator of wealth maximization is increase in share price. In case of AB we see that in year 2004 the Earning per Share was 18.19 and in year 2005 it become 31.26 it was almost doubled as compare to the previous year. That influences the investor to invest their money in the AB Bank Limited share because the return on those shares will increase year by year. Existence of an organization depends upon mainly two things one is, Are they generate sufficient amount of profit and another things is the loyalty of customer and the investor regarding that organization. Here we see that the profit of AB Bank Limited become almost doubled in year 2005 than the previous year and the investor will more attractive when they see that the return on share also become doubled in last year. So we can say that, AB Bank Limited has good enough potentials in the money market of Bangladesh. Rate of Interest 14.50% p.a. – 17.50% p.a. Rate of Interest 16.00% p.a. Target Customer Both female & male employees may apply viz. employees of reputed Banks & Leasing companies, reputed Local Corporate, MNCs, NGOs, Airlines, Private Universities, Schools and Colleges, International Aid Agencies and UN bodies. Government Employees. 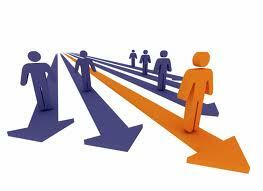 Self-employed Professionals (Doctors, Engineers, Chartered Accountants, Architects, Consultants). Businessmen with a reliable regular source of income. Rate of Interest 16.50% p.a. • Students of reputed Educational Institutes, such as Public & Private Universities, Medical Colleges & Engineering Institute. • Doctorate degree (PhD), FCPS etc. • Educational Qualification: Minimum HSC/A-Level Pass. • Bank officials (Equivalent to Senior Principal Officer of NCBs, AVP / Branch Manager of Local and Foreign banks) and Department Head of Multinational Company or established Local Corporate. Guarantors must be accepted by the Branch Manager / Head Office. Rate of Interest 14.50% p.a. – 16.00% p.a. At AB Bank we provide complete range of solutions to meet Corporate Customers’ requirement. Our Corporate Banking solutions include a broad spectrum of products and services backed by proven, modern technologies. Our specialist teams offer a comprehensive service providing finance to large and medium-sized businesses based in Bangladesh. For more information as to how we might best meet your corporate debt needs, please contact us at our Corporate Head Office. We have a specialist Structured Finance Team who arrange and underwrite finance solutions including Debt and Equity Syndication for financial sponsors, management teams and corporates. Also we provide corporate advisory services.